i’m all about the green. The Friday farmer’s market did not disappoint. As a I type this, my fingers still smell of fresh picked basil. Smells and memories go hand in hand. Pesto may be one of my favorite things in the entire world. My mother always did the freezing in ice cubes trick growing up. I would take one cube out and throw it on some just cooked whole wheat pasta and eat in a hurry. Today I decided to make an adaption on regular pesto, this is more of a sauce and veganized with nutritional yeast instead of parmesan. Measure the olive oil and almond milk, pour both in a measuring glass and whisk. The amounts may vary depending on preference of fat quantity in your sauce, however, the liquid should be 1/3 cup. Add all ingredients to a food processor and process until creamy. The light was playing tricks on me with these photos. Lunch will be a simple panini with a new combination of flavors. Grilled pattypan squash, tempeh bacon, veganrella, and basil sauce will be served on a 100% whole wheat bread from the farmer’s market. Hopefully, this will be just as tasty as I imagine it to be. 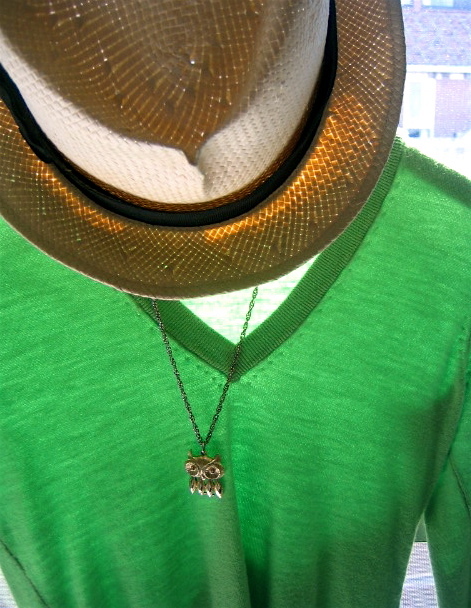 The outfit of the day features a bright green cashmere sweater and a straw fedora. I am a big hat wearer, especially to keep my skin safe from the sun. Also, I wear a tinted moisturizer with spf 15 and bronzing powder. On the bottom half, I have vintage levi cut-off jean shorts and my favorite black gladiator sandals. I am saving up for a new bag and will definitely be showcasing it on the blog. I am not a vegan fashionista, unfortunately. I don’t wear fur unless it is vintage. I would not buy any new fur. One of my favorite bags is a vegan matt and nat bag that is almost five years old. What are some of your favorite summer looks? Since I am more of a fall dresser, I favor trousers, black glossy heels, and cashmere. I love lace as well. Tomorrow, I will be showing some of my favorite lacy finds from the fall runway shows. I hope everyone has a fabulously green Friday. I will always love the hipster/preppy boys who make up Vampire Weekend and sing of an Oxford Comma and Cape Cod Kwassa Kwassa. A new one is The Vangaurd. I don’t know too much about these Brooklyn boys but I hope to see them soon in Rhode Island or in the Fall in NYC. « all about the neckline. Oh, I love basil!! 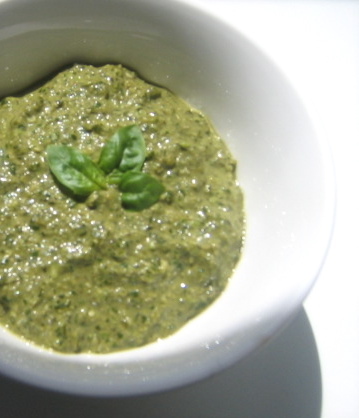 And the pesto looks so yummy! And just a word of random knowledge…I heard that Matt & Nat are going ‘high-end’ which means they will be increasing their prices on their wonderful purses and such! Not that they were cheap to begin with, from a poor college students perspective at least.. So if you want a new Matt & Nat, get it now! I don’t know how true this is, but it’s just what I heard from a Matt & Nat sales lady..which could’ve just been her way of pushing me over the fence I was on when deciding to purchase my new wallet..
oooo-i LOVE vampire weekend and i like the vanguard. oh, and basil. that too. Thanks for the info Sara! I have so much basil left, I don’t know how I am going to eat it all! Vampire Weekend is one of my favorites in the last few months. 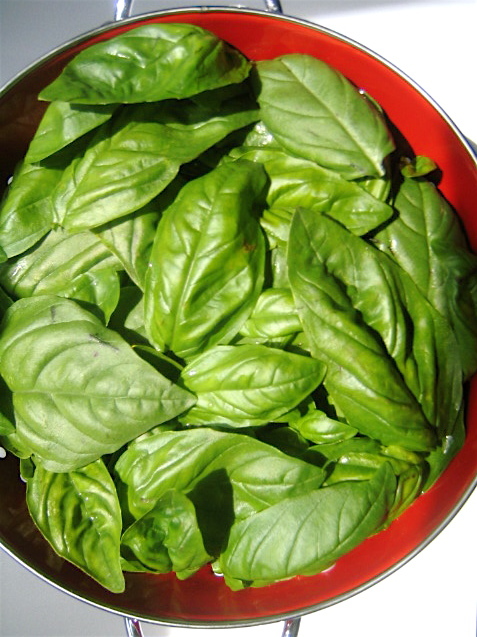 As for the left over basil, you could always freeze it.